Much like most keyboards from Das Keyboard, the design of the 5Q is elegant and serious, with the designer clearly focusing on professional users. 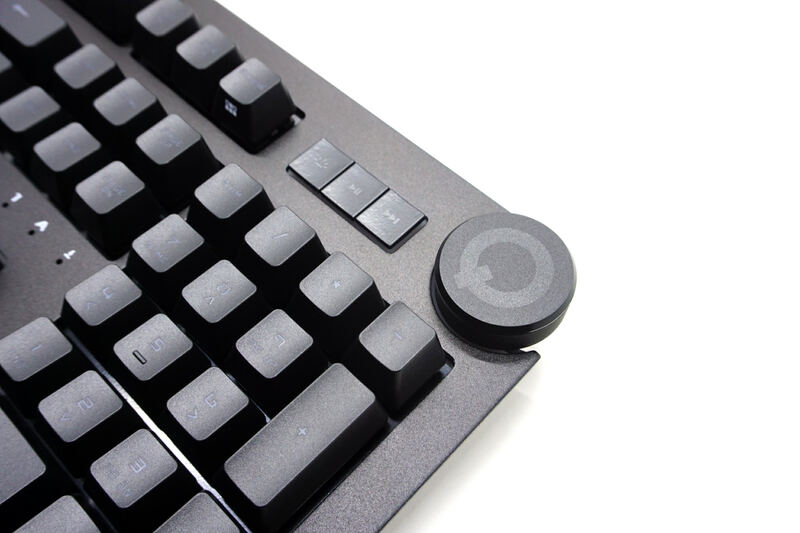 If not for the volume control wheel and the three flat buttons above the numpad, the 5Q could be easily mistaken for a simple run-of-the-mill keyboard. That being said, the Spartan design of the 5Q also means it's not locked in any one niche; gamers that prefer a clean-looking desktop over peripherals with complex motifs would be right at home as well. A closer look reveals that the top part of the keyboard is metallic. So perhaps it's no surprise then that the 5Q is noticeably heavier than most standard-sized mechanical keyboards. 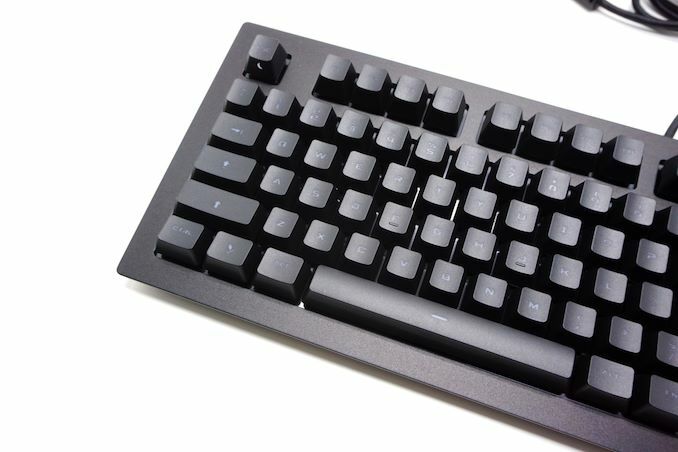 Even though the top plate of the keyboard is metallic, Das Keyboard did not go with the “floating keycaps” design that many other manufacturers adopt. 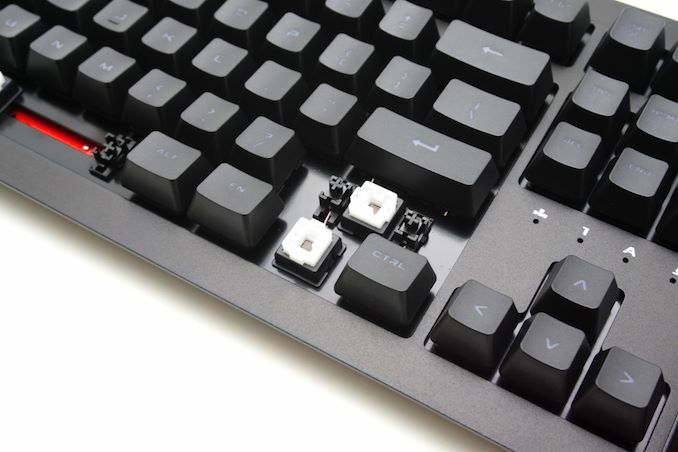 The 5Q sports standard-height keycaps that are engulfed by the metallic frame, just like a classic keyboard. Das Keyboard moved the indicator LEDs just above the arrow keys, leaving the top right corner of the keyboard to the three extra buttons and the volume control knob. A nice touch is that the indicator LEDs light up slowly instead of instantly, creating a subtle visual effect and going easy on the eyes in a dark room. 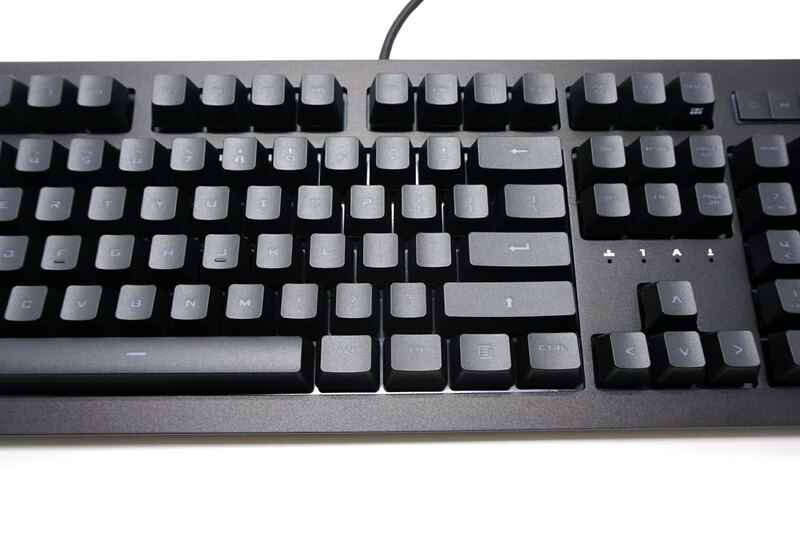 We received the US layout version of the Das Keyboard 5Q. The main part of the keyboard is a standard 104 keys design that does fully adheres to the ANSI layout, with a 6.25× space bar and seven 1.25× bottom row keys. There is no company logo to be found anywhere on the keyboard itself. The characters on the keycaps are placed at the center of the keycap, as the LEDs of the Omron mechanical switches are found at the center of the key. The font is perhaps a bit too small and/or too bold for a keyboard whose main feature relies on backlighting. The first of the three extra buttons above the numpad controls the backlighting brightness. There are eleven brightness levels, from 0 (off) to 10. The other two buttons are meant for basic media control and are a Play/Pause button and a Forward button. Considering that the Back and Stop buttons are missing entirely, perhaps the designer could have these two buttons do something more useful instead. A large volume control knob dominates the top right corner of the keyboard. The knob’s rotation feels nothing short of perfect, with a very soft and smooth ratcheting movement. 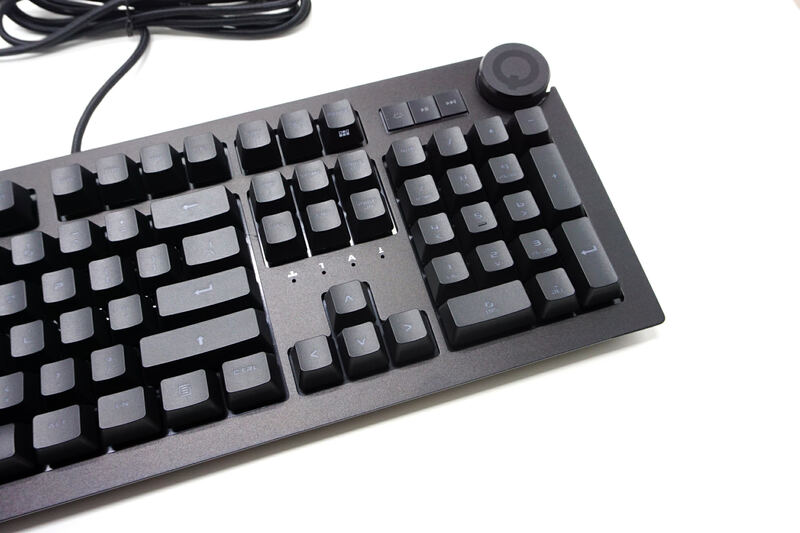 Furthermore, the knob itself acts as a large button, one that launches the keyboard’s programming software. 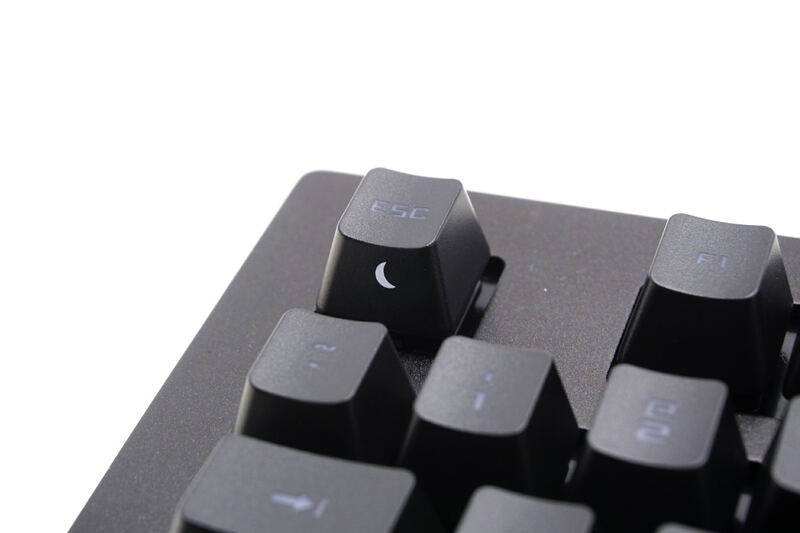 While the company’s logo may not be found anywhere on its top side, Das Keyboard engraved their logo across most of the 5Q’s bottom side. 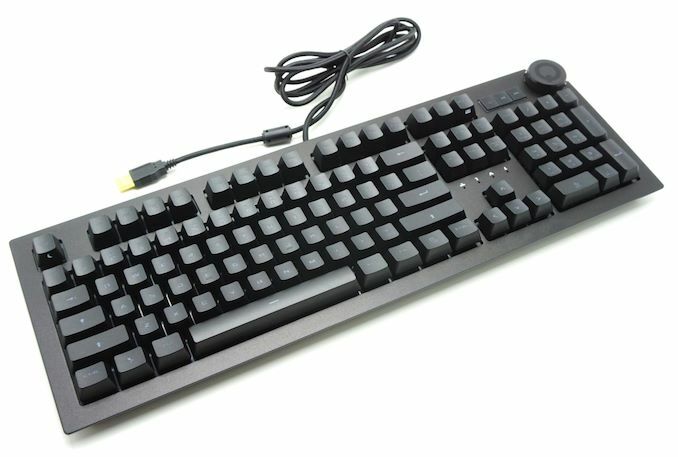 Other than that, we only found rubber anti-skid pads and two plastic tilt-adjustment feet at the bottom of the keyboard. The tilt adjustment feet look a bit small but note that the keyboard does have a slight tilt by default. One of the unique features of the Das Keyboard 5Q is the Gamma Zulu mechanical switches, which the company developed and are manufactured by Omron. The Gamma Zulu switches are exclusive to Das Keyboard – at least for the time being. These appear very similar to Logitech’s Romer-G switches, but their travel distance is shorter, at 3.5 mm instead of 4.0 mm. The Gamma Zulu switches also have the highest reliability ratings in the market, as they are rated at 100 million keystrokes each. Overall, the Gamma Zulu switches are silent tactile switches, and someone could possibly compare them to Cherry’s MX Brown switch. But their actual feeling is a lot different. Meanwhile the design of the Gamma Zulu switch is also entirely different than the Cherry MX switches and their clones, with the LED placed at the center of the switch and a semi-translucent stem surrounding the switch. Although this design does have certain advantages, especially with the strength and smoothness of the backlighting, the keycaps of the Das Keyboard 5Q are incompatible with any keycap that is designed for Cherry MX switches and clones. It will be nearly impossible to find a replacement keycap set for this keyboard, let alone fancy custom keycaps. That could prove to be a problem in the long run, as the 5Q is using simple ABS keycaps with laser-etched characters. Sooner or later, these keycaps will at the very least become polished, and unless third parties step in and start producing compatible keycaps just for the Gamma Zulu switches, replacing those keycaps will probably be possible only through the company’s support department. The RGB backlighting of the Das Keyboard 5Q is exceptionally well applied, with minimal bleeding around the keycaps and very bright, clean legend characters. The keyboard also features an “enhanced lighting” mode that requires a USB 3.0 port to function, as it quite obviously has high power requirements that go beyond the 2.5W that a USB 2.0 port can provide. When connected to a USB 3.0 port, the Das Keyboard 5Q can indeed reach very high illumination levels that would be blindingly bright for use in a dark room. And even in a partially sunlit room, the keyboard’s LEDs were still visible. The heart of the Das Keyboard 5Q is an STMicroelectronics STM32F401 ARM microcontroller. It is one of STM's most efficient microcontrollers and one of the best that we've ever seen to date inside a keyboard. 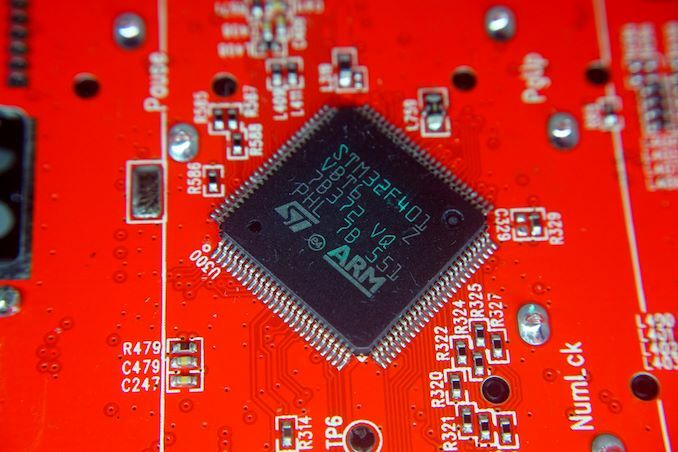 It has an 84 MHz processor with a 12-bit ADC (0.41ms), which is why the Das Keyboard 5Q has a virtually instant response time when it comes to internal functions. 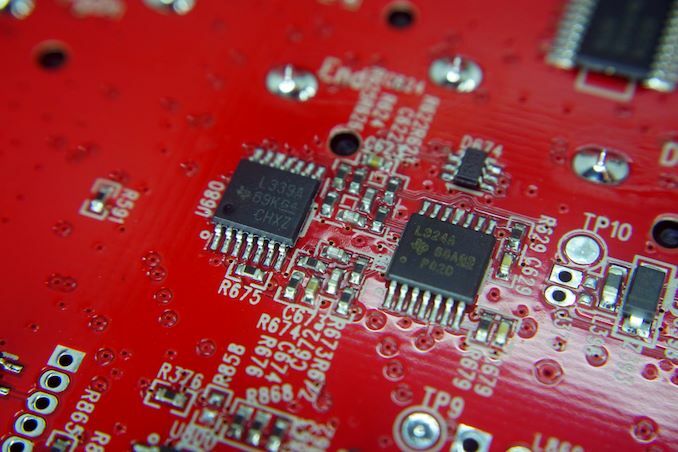 End-to-end response times are a bit higher, as no matter how fast the controller is, as a single part of a whole system it isn't resposible for other sources of latency such as the USB bus itself. It is also worthwhile to mention that we spotted an Altera (Intel) 5M80Z Complex Programmable Logic Controller on the keyboard's PCB. 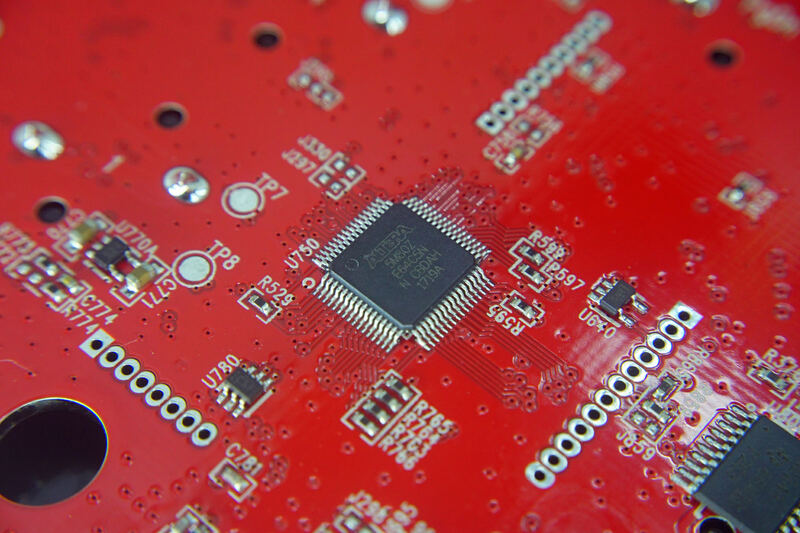 This chip is commonly used for signal decoding, so it is probably used for the notification features. a) None of the functionality they added is actually keyboard specific, and really just amounts to a notifications app that runs on windows, but NOW makes a light blink on on your keyboard. You know what drives this stuff? The demand for sales. "This theoretically sounds very interesting"
"most enthusiasts owning or wanting a mechanical keyboard nowadays"
Do you have any proof for that?